We celebrated Light and Dark for First Friday tonight by creating an immersive multi-shadow exhibit in the classroom, and playing with moire patterns using a projector on the front window. It’s fun to play with light on these winter nights when it’s completely dark by 6:00 p.m, especially with a glass of wine! 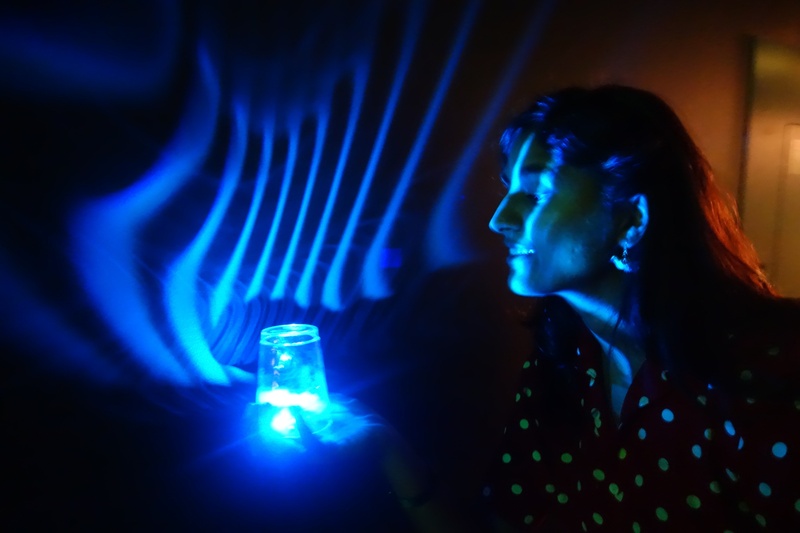 In this photo, Amisha is making a moire pattern by shining light through a plastic cup that has a ribbed pattern all the way around. A moire pattern is the image you see when 2 overlapping patterns are slightly shifted or rotated. These patterns can be seen all over the place, if you start to look. On highway 280 between San Francsico and Los Altos, there is an overpass with a fence on both sides that makes a moire pattern that you can see as you approach it (while of course, keeping your eyes on the road!). You might also have noticed moire patterns when 2 transparent fabrics overlap, or when walking past parallel pieces of perforated metal. I find moire patterns to be very compelling, maybe because of the delightful visual surprise. You can make moire patterns at home by finding 2 pieces of material that are transparent and have a repeating pattern. For example, my wire mesh laundry basket makes moire patters, and so do window screens and plastic combs. What else can you find that does this? What are all of the variables you can test to look for new patterns? What happens if you move the materials closer and farther apart? What happens if you move them side to side, up and down, or rotate them? Does it still work if you overlap 2 different patterns? What I love most is making moire pattern shadows in the dark by shining a flashlight through the materials. Let us know what you try!